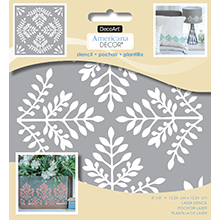 Timeless decor stencils perfect for use on furniture and home décor pieces. These flexible stencils are made for durability and ease of use with paints or texture products. With designs appropriate for indoor and outdoor projects and a variety of sizes, Americana Decor stencils work for almost any home decorating style.